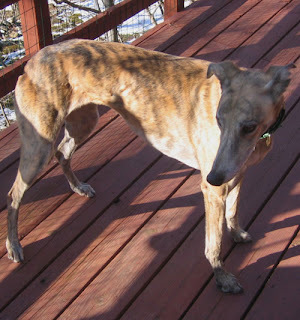 We are sad to report that one of our long term FFGR, Inc. volunteers, Donna (Domenick) lost her beautiful greyhound Kacy. Kacy died suddenly and unexpectedly in her home. She had no signs of illness and was fine as usual. Donna reported that Kacy went to her usual spot to lie down on her bed and Donna heard a slight whine. When Donna checked on Kacy she could tell that something was terribly wrong. Kacy died while Donna was holding her. Donna called her vet and her vet seems to think that Kacy’s heart stopped. We don’t have to describe how totally shocked and devastated Donna and her family are. Donna and Kacy have been a central part of our family since she and her husband adopted Kacy in March of 2007. Kacy has always been loved so much by the entire family. This has to be hard to accept. Kacy was eight years old in September. She was at our meet and greet in Gettysburg just a week ago. We all know how much Kacy was loved; Donna never missed an opportunity to tell us how much Kacy meant to the whole family. But we also know that Kacy was a very lucky dog to have found her family. We are comforted to know that she always had the best care and was the center of attention. Kacy, you were so loved by your family and everyone (including your extended FFGR, Inc. family) who knew you; rest in peace sweet girl.